The sengoku bune is distinguished from other Japanese ships by its sail. This sail is carried in addition to the oarsmen on board, and sailing with the wind allows it to chase down enemy ships. The sengoku bune has few crew compared to similar sized ships, so it is best used to attack smaller, weaker ships rather than those in its own weight category. 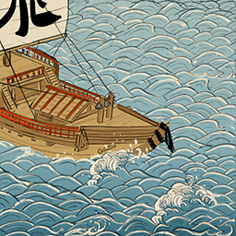 Historically, sengoku bunes were large junk-style ships used to carry rice and sake. In 1609, converted sengoku bunes were used in the Shimazu raid on the independent kingdom of Ryukyu. These were joined in the attack by ataka bunes, warships that resembled large floating castles. The combination together was an interesting attempt to advance the art of sea warfare. Sails make it faster than other ships. Large crew for boarding smaller ships.